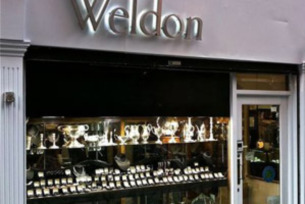 Weldons of Dublin is one of Dublin's longest established antiques shops. Founded a century ago, it is a fourth generation family business. They have an extensive collection of vintage and modern jewellery, and are leading experts in the field of antique Irish silver. Visitors, whether they are new collectors or long-standing friends, are always welcome to view the superb selection in their shop. They specialise in early Irish silver, and have one of the largest collections of Georgian Irish silver in the world, available to view five days a week. It is more than just a business to them, the shop is like a museum where you are welcome to handle the exhibits! They are passionate about building collections for customers, advising and helping as best as possible.